I’ve now been back in Cavango for almost two weeks, and it has been satisfying to participate in the healing and care of some very ill people. They are coming from farther and farther away, as a day’s drive by car or motorbike is not at all unusual, and we’ve also seen many arriving from several large cities (where they have large hospitals) to our little rural clinic, because there is less and less medication and quality care available anywhere. An accurate diagnosis is such a precious commodity, as is treatment appropriately rendered. Two of these new patients have had Rheumatoid Arthritis for years, a hideous and devastating illness (especially in a high-labor, travel-by-walking culture) that inflames virtually every joint. I brought in from Namibia a medication specifically for this disease and, though these folks will not likely realize a cure, they will experience much less joint pain and inflammation in coming weeks. They were so grateful for some hope of decreased daily pain. The people here struggle through much loss and pain and think of themselves so little as they display such beautiful dispositions – they challenge me multiple times daily. A 70-year-old man presented suffering with what I call “Job’s Disease” or Bullous Pemphigoid. A horribly itchy disease consisting of large blisters virtually covered his body which then became quite painful as they became infected. He tolerated this disease for more than two weeks before coming in. He smiled (!) as he told me, “Doctor, I am suffering greatly.” He responded so well to simple medication (which he would have likely received nowhere else in this country – except at CEML) and is almost clear after less than a week of treatment. A young woman came in with a largely destroyed breast from mastitis tolerated for almost a month before walking two days to arrive at the clinic. Several others arrived with severe heart failure from Rheumatic Heart Disease from untreated strep throat. An extremely swollen 12-year-old boy came to us and died the same day from acute renal failure, likely also from untreated strep throat. He had sat for over a month at a community hospital which had no meds. A woman’s whole right trunk was covered in Shingles, and another woman had over a dozen large keloids (grossly inflamed, deformed and painful scars) for years. 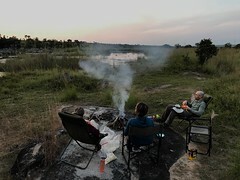 I saw several women with varying degrees of liver failure from taking all-natural “traditional medicine”, two cases of elephantiasis, and a young man with a broken leg and severe wound from an attack and crushing bite from a hippopotamus (living not far from us). A 70-year-old presented with the largest prostate I’ve ever examined (softball sized compared to a normal walnut size) in a man with metastatic disease who will not live long. 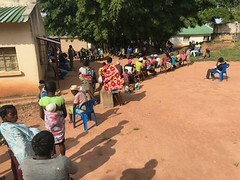 We saw five new cases of tuberculosis (including a two-year-old with way-too-common spinal TB), and two boys and a man with severely deformed forearm fractures that all need surgery, but they (or their family) each refused and said they will accept what we can do. I hope they heal with good function and I was reminded again how limited we are out here and how dependent we are upon our Father for good outcomes. These were a few of the patients I served this past couple weeks, shared to remind you of the radical needs in people just like you and me here and in (way too many) parts of the world. Our patient volume is down somewhat because of my extended time in the US combined with the absence of significant numbers of malaria patients (which will all change very soon). I have visitors this week in Cavango, a team of four men from different parts of the US, who shipped to us a container with 48,000 pounds of goods that will benefit our patients, including a 40x100ft steel building that will allow more of our patients to sleep under roof during the rainy season (when it’s not raining, even the sickest prefer to sleep outside near a fire). 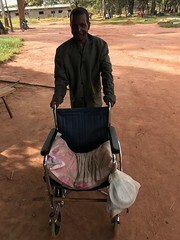 The container includes 5000 bars of soap, covered stretchers on wheels called Zambulances – invented in Zambia) that can be pulled by a motorbike (we will place one in eight different villages so that they can transport their critical patients to us without delay), adult diapers for our fistula patients, scrubs for our nurses, solar-powered audio bibles, benches, used clothing, etc. So many will benefit from the (unseen) work of these men in organizing this container and the many unnamed people who contributed to its contents. The building will likely go up next year as part of a simple expansion of our hospital (over the next several years) to better serve those most ill. 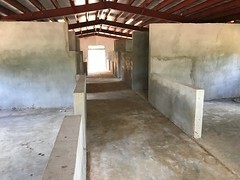 If you might be interested in coming over on a team and helping with construction, or financially contributing to filling our next container, please let me know. We have, for example, 100 donated hospital beds coming over next year via SIM. Scott and Paul needed 24hr (!) to drive out in a large truck carrying a skid-loader while following the truck carrying the container (the Angolan driver said it was the worst “road” he had ever traveled, laughing while he said, “You can’t call that a road!”), leaving Lubango at 2a and arriving the same hour the next morning (we usually make the trip in 10hr). Bob and Darrell flew out with MAF (2hr), arriving a bit fresher than Scott and Paul! Bob is 88 years old, lives in San Diego and is making his 7th trip to Angola (along with many trips to other countries). He shopped tirelessly for supplies to put in the container and made multiple trips to Colorado Springs from his home pulling trailers of valuable items to fill this container. 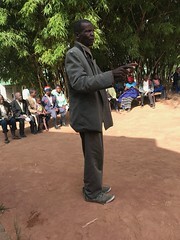 When I asked him why he continues to put forth so much effort to serve these people, he said that he can only do so much, he knows that every trip might be his last, and he sees himself as one of the four men who cut a hole in a roof to present a sick man to Jesus. He wants to contribute to any little task that might help get hurting people to the King. Bob is behind the “Zambulances”, which is the stretcher on wheels mentioned above, manufactured by unemployed men in LA. Darrell is 87 years-old and was a missionary in several countries for over thirty years, including in Cavango until it was destroyed in 1976. He is remembered fondly by the older folks here as someone who loved them and told them about Jesus. He tools around with his walker encouraging everyone he encounters and helps with any small task he can manage. 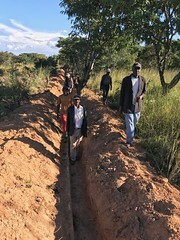 His son Paul (who spent part of his childhood in Angola and Zambia) shouldered all of the trip arrangements, owns a construction business in Colorado Springs and has been a part of many construction projects in Angola and other developing countries, using his resources and knowledge to creatively benefit many people. He brought with him architectural drawings to use for the building project that he had created over many hours before coming to Angola. He has spent most of the week in a skid-loader, covered in Cavango’s red dust which makes him look somewhat other-worldly. Scott is from Missouri and grew up in several countries, while his family served Jesus as missionaries. He fired up the bull-dozer (which is here for the suspended airstrip project) and has been wrestling with termite hills and tree roots while clearing/grading the land for the new building. He is looking for ways that he can serve the people of Cavango now and in the future. These beautiful men (who will never be known for all of their contribution and effort) are choosing to creatively find ways to the roof to bring hurting people to Jesus… When they were not sweating under the Angolan sun, we spent many hours in thoughtful, brainstorming conversation (and laughing a lot) as these guys bring passion, resources and creative ideas for serving the rural people here. These guys get it. 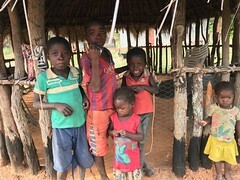 They embrace Jesus’ definition of neighbor – they want to do what they can to help – and they embrace Jesus’ “golden rule” – they are doing what they would hope their American brothers might do for them had they been born in rural Angola… It’s been a blast (and such an encouragement) working with them this week in Cavango. Lubango, a city of about a million people, is getting its first stop lights. The green light rotates so that only one of the four lanes is permitted to proceed at any one time. I was trying to pinpoint the time of illness onset for a 20-something pregnant woman. She didn’t know hours, days, weeks, or months. We were finally able to identify the onset when we related it to a cultural event, which in this case was when she began cultivating her field (which is very much the same time for everyone). By relating the illness to this event, we were able to approximately pinpoint the onset. The people of this culture have little need or desire for specifics of any kind. They speak of everything in the most general of terms, including anything re time, distance, location, etc. If their arm/leg hurts, for example, one can rarely get them to specifically identify which part of the arm/leg is the worst. Same with abdomen or chest discomfort, which makes identifying an accurate diagnosis a challenge. Our guard can’t read and understands no math. We keep his salary for him and help him with with simple purchases. It is easy to see through him how illiteracy and lack of basic education keeps one in a vulnerable state of dependence on those who are educated, and how many governments exploit this to their advantage. Malaria has returned, as yesterday we had two children present in coma from cerebral malaria. It has been pleasant focusing on non-malaria illnesses for a season, but this awful disease will soon consume most of our energy for the next six months or so. As I type, it’s about 4a, I just put laundry on the line and it’s raining for the first time since April. What a beautiful sound and smell! We have been seeking permission from provincial governments for 5 years to work in areas that serve as hubs for two large, unreached people groups who live in extremely harsh, desert environments and have their own language and culture (unreached – they haven’t heard the Good News of Jesus’ radical affection for them or been introduced to our Father). It was the opportunity to serve especially these two groups that drew me to Angola. 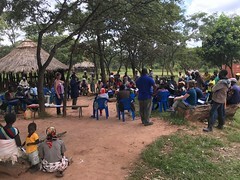 We received written permission this week to work among the Mucabal people in a town called Virei (vee-ray) and we are told that verbal permission has been granted for the town of Oncocua (onkauckwah) in the Cunene (Ku-neh-nee) province, home to thousands from the Muhimba (moo-heem-bah) tribe (written permission to soon follow). These folks are unreached because of isolation, extremely harsh (desert) living conditions, and having unique African languages, but they have also historically been resistant to the gospel, making our ministry ideal for sharing and demonstrating the love of their Maker, no strings. We can reach them because of the beautiful ministry of Mission Aviation Fellowship and its two pilots and three planes. It looks like 2018 will present some beautiful new opportunities for our health care ministry. 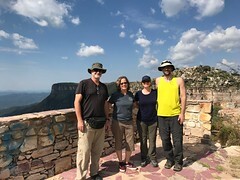 Please pray for more health care workers willing to go to the harsh and uncomfortable places where so much treasure resides in these unique and largely forgotten peoples. As I write, Betsy is on her way back to Angola!